Attack of the POD People … EEEK ! 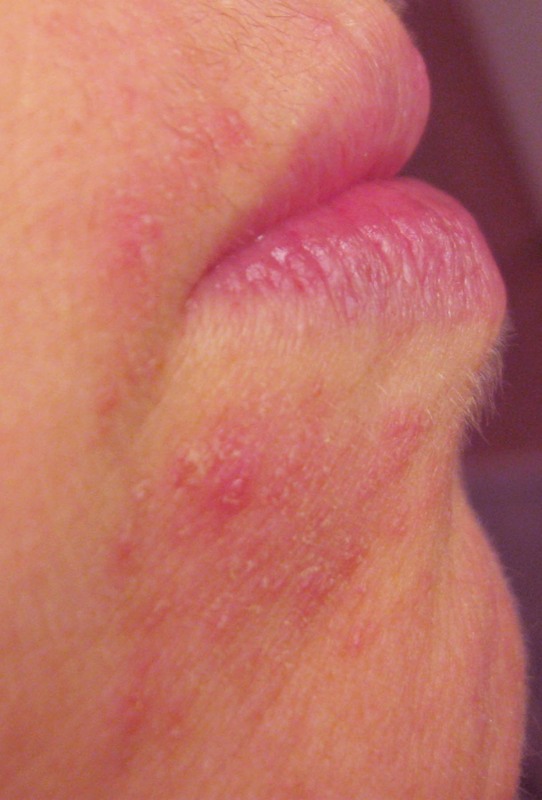 Abstract: This is one woman’s narrative of her experiences with perioral dermatitis (POD). In his film, Crimes And Misdemeanors, Woody Allen declares that comedy is tragedy plus time. While POD was not exactly a tragedy for me; it did, however, negatively affect me physically and emotionally six months of the year. In reading my attempts to ease the situation, feel free to laugh (or cry) both with me and at me! It’s Thanksgiving eve and I’m counting my blessings. Near the top of my list is being Perioral Dermatitis – free, no small feat after my second three-month bout within a year. 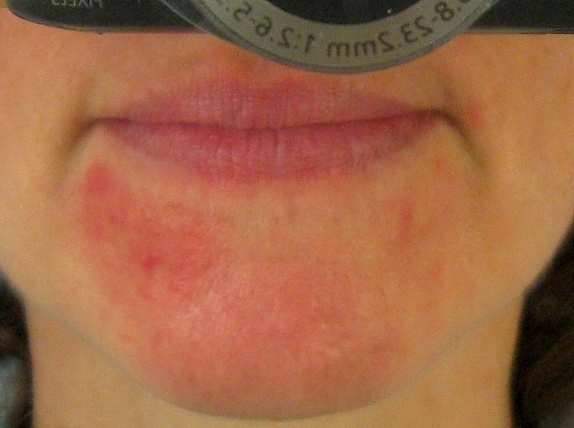 On face value, literally, perioral dermatitis (POD) might not seem to be such a big deal, but when it’s your face being affected for so long, the ramifications are real. I take this opportunity to share my experiences and missteps in hope of helping others cope with and, ultimately, cure themselves of this mysterious condition. I offer some personal details so you can find some similarities and know that you’re not alone in your path to recovery. Also, perhaps if more patients describe their personal histories, research of this disease can advance faster. Get diagnosed by a professional ASAP!!! *This is the single most important message to act on! POD, psoriasis, eczema, and other dermatological conditions have many overlapping and often hard to distinguish symptoms that we lay folk don’t know how to diagnose. My husband and I spent hours analyzing images on the Internet and in books. We were wrongly convinced I was suffering from other conditions and tried assorted treatments to cure misdiagnosed ailments. These well- intentioned remedies not only delayed my seeking expert advice, but, actually, exacerbated my POD! The dermatologist I saw recognized the familiar features of POD immediately based on location, pattern, and nuanced markings of my facial eruptions. Just hearing that POD is curable set my mind at ease there and then. Having been diagnosed 10 years ago with a form of psoriasis affecting my fingernails, I assumed my facial condition was of the same origin. My research for its treatment left me more disheartened – each case was unique with no magic pill or cream. Then I read in the People’s Pharmacy about atopic eczema. “A-ha”, I thought – those are my symptoms. Then for the next month I obediently followed their suggestion to drink Oolong tea. A lot of it (3-4 cups / day). For good measure, I even rubbed some on my blotchy face. Consequently, both my jogging pace and frequency and urgency of urination shot up. I became more irritable from the effects of the strong tea’s caffeine, and then had to wean off of it. Meanwhile, my POD stayed as itchy, flakey, topologically bumpy, and red as ever! The Oolong tea, along with the other home remedies (see Chart at end of piece), proved to be a total Waste Of A Month Towards Healing! the time of my dermatology visit. Naively, I chalked up the symptoms to the cold weather. Fast forward to October to December 2011, my next POD breakout. Business was flush, but there was a lot of pressure to meet deadlines and other self- employment headaches. Much worse, our 2 senior dogs had GI tract issues. When one of our dogs is sick, anxiety rules the roost. Having both of them sick doubled the fear and stress. It took 3 months for my face to heal completely. That autumn, each day was unpredictable as to how my face would look and feel. Sometimes I appeared symptom-free for half a day, then wham, the second part of the day it was as bad as it gets. Mornings seemed fine for the first 30 minutes, but most often my complexion had steadily deteriorated leaving me with physical and emotional discomfort. My self-image was at an all time low. Winter and spring saw our dogs’ health worsen. One died in May, the other in July. We had suffered deeply during their downfalls and afterwards while grieving. We had introduced a new pup in June, then another in September. Their arrivals did bring hope and joy, but also a lot of stress. At times, raising pups is like a circus act. Our sleeping pattern was terrible and our emotions were all over the chart. I broke out with another case of POD one week before our second dog died. I embarked on another 3 month episode which was the most severe I had to endure. I’m convinced that the overwhelming stress acted as a factor in my recurring POD. This time I photographed the different stages in case the symptoms cleared before my appointment. I needed to know what I had and how to treat it. You’re not alone in all those jumbled feelings and thoughts racing through your head. My own unnecessarily months-long bouts contributed to altering my generally upbeat, energetic demeanor to being uptight, easily irritated and somewhat depressed. Had I known how to treat the disease, I could have saved my husband, and myself, a lot of time and upset. That’s why I urge you to seek the professional help of a dermatologist! I’m lucky to have such a tolerant spouse – he did a great job helping me keep things in perspective (prior to us learning that I had POD) by assuring me my condition would eventually improve. He was right. In the interim, he had to bear with my disposition change – on top of dealing with the demise of our dogs and life’s daily obstacles. Those other factors did play a significant role on my overall state of mind, but the recurring POD weighed in heavily on me. Like most patients, I responded quickly to prescribed doxycycline. I had relief within the first 24 hours and saw steady improvement. By week two on ‘doxy’, I looked and felt so much better, and as my dermatologist predicted, I was POD-free by week 4. So, look forward to having POD cured. Then, you can refocus all that energy into conquering other issues like wrinkles, liver spots, and why do my eye sockets seem to be receding into my head? But I digress. Life is grand. Go to your dermatologist and start your healing. This entry was posted in Anonymous and tagged doxycycline, grief, illness narrative, P.O.D., perioral dermatitis, self-care, self-diagnosis, stress by humanemedicine. Bookmark the permalink. Thank you for sharing your journey to this successful outcome! Loved your final smiling photo. Your article (advice) will be helpful for many others who are suffering from the same or similar condition. For a much more complete – and, believe or not, somewhat entertaining – version of the details surrounding this POD passage, you should click on either the Word.doc or PDF links found towards the top of article just under the ‘Keywords’ listing. Thanks for your positive feedback!